This article is about the Ruby & the Romantics single. For the 2010 French film, see Our Day Will Come (film). For the Irish Republican slogan translated as "Our Day Will Come", see Tiocfaidh ár lá. "Our Day Will Come" is a popular song composed by Mort Garson with lyrics by Bob Hilliard. It was recorded by American R&B group Ruby & the Romantics in early December, 1962, reaching number one on the Billboard Hot 100. 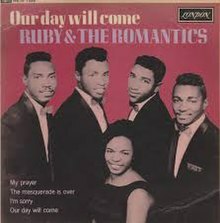 The song's composers were hoping to place "Our Day Will Come" with an established easy listening act and only agreed to let the new R&B group Ruby & the Romantics record the song after Kapp Records' A&R director Al Stanton promised that, if the Ruby & the Romantics' single failed, Kapp would record the song with Jack Jones. Stanton cut two versions of "Our Day Will Come" with Ruby & the Romantics, one with a mid-tempo arrangement and the other in a bossa nova style; the latter version, featuring a classic Hammond organ solo, was selected for release as a single in December 1962 and reached number one on the Billboard Hot 100 in March 1963. 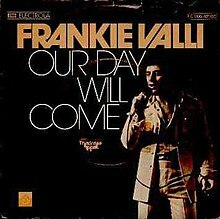 "Our Day Will Come" also charted at number 11 in Australia and at number 38 the United Kingdom. The personnel on the original recording were: Leroy Glover on organ; Vinnie Bell, Al Gorgoni and Kenny Burrell on guitars; Russ Savakus on bass; Gary Chester on drums; and George Devens on percussion. "You Can Bet (I Ain't Goin' Nowhere)"
(1975) "Our Day Will Come"
Frankie Valli recorded and released "Our Day Will Come" in 1975. His rendition features Patti Austin on accompanying vocals. Valli's version reached #11 on the U.S. Billboard Hot 100, and on the Adult Contemporary chart, it spent two weeks at number two. Internationally, it also reached the Top 40 in Canada (#30) and the UK (#11), doing best in Ireland, where it reached number three. 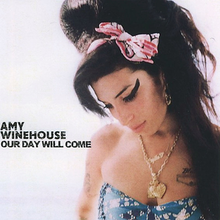 (2011) "Our Day Will Come"
Recorded for her 2003 debut album Frank, the Amy Winehouse remake of "Our Day Will Come" was first issued on the singer's posthumous compilation album Lioness: Hidden Treasures. The song was released to UK contemporary hit radio on November 2, 2011, as the album's second single, Winehouse's first solo single release since "Love Is a Losing Game" in 2007 (a duet with Tony Bennett on "Body and Soul" had been issued as a single on September 14, 2011—which would have been her 28th birthday). Recorded by Theo Sarapo as "Ce jour viendra"
April 1963: Billy Fury on his album Billy. May 1963: Julie London on her album The End of the World. June 1963 (recorded): Blossom Dearie on her album Blossom Dearie Sings Rootin' Songs. This recording used as Ending title of Jacques Rivette film "The Story of Marie and Julien" (2003). July 1963: Bobby Darin on his album 18 Yellow Roses & 11 Other Hits. September 1963: Patti Page on her album Say Wonderful Things. December 1963: Brenda Lee on her album Let Me Sing. 1963: George Chakiris on his album You're Mine, You. 1963: Les Compagnons de la chanson as "Ce Jour Viendra" on their EP Vol. 4. 1963: The Earls on their album Remember Me Baby. 1963 Percy Faith and his Orchestra on his album Themes for Young Lovers. 1963: Dee Dee Sharp on her album Do the Bird. January 1964: Bobby Rydell on his album The Top Hits Of 1963. September 1964: Pat Boone on his album Boss Beat. November 1964: Julie Rogers' – B-side of "Like a Child" number 21. 1964: Betty Everett and Jerry Butler on their album Delicious Together. 1964: The Lennon Sisters on their album #1 Hits Of The 1960s. 1964: Trini Lopez on his album The Love Album. 1964: Nancy Wilson on her album Today, Tomorrow, Forever. 1964: Sonny Stitt and Bennie Green on their album My Main Man. March 1965: Doris Day on her album Latin for Lovers, arranged by Mort Garson. 1965: Willie Bobo on his album Spanish Grease. 1965: The Supremes recorded their song for the album There's a Place for Us, but remained unreleased until 1987 and 2005. Mary Wilson was the lead singer on the recording. February 1966: Cher recorded a version for her album The Sonny Side of Chér. The song was the B-side of the hit "Bang Bang (My Baby Shot Me Down)". Cher's version was also issued as an A-side single in November 1972, following its inclusion on a United Artists compilation disc entitled Cher, however, the single did not chart. October 1966: Cliff Richard on his album Kinda Latin. November 1966: Herb Alpert and The Tijuana Brass – B-side of their single "Mame" number 19/ parent album: SRO. 1966: Fontella Bass on her album The 'New' Look. 1966: James Brown on his album Handful of Soul. 1966: Claire Lepage (fr) as "Ce Jour Viendra" on her album Bang! Bang!. 1966: Chris Montez on his album Time After Time. 1966: The Vibrations on their album New Vibrations. 1967: Buddy Merrill on his album The Many Splendored Guitars Of Buddy Merrill. 1967: Cal Tjader on his album Along Comes Cal. 1967: We Five on their album Make Someone Happy. May 1968: The Lettermen on their album Goin' Out of My Head. 1968: Jimmy Castor on his album Hey Leroy. 1968: Toni Lamond on her EP A Touch of Toni. 1968: Inga Sulin (fi) as "Kun Aika" on her album Niinkuin Jokainen. 1969: Classics IV on their album Traces. 1969: Spiral Starecase on their album More Today Than Yesterday. 1970: Isaac Hayes on his album ... To Be Continued. 1970: The Peter Ivers Band with Asha Puthli (released in 2009). 1970: Arthur Prysock on his album Fly My Love. 1972: Charles Brown on his album Driftin' Blues. 1972: Bobby Vinton released a version on his album Sealed with a Kiss. June 1973: Lorna Luft (single). 1973: The Carpenters on their album Now & Then. 1973: Linda George as 'Miss Linda George' (single). August 1974: The Undisputed Truth on their album Down to Earth. May 1975: Charity Brown – B-side of her single "Take Me in Your Arms (Rock Me a Little While)" number 5/ parent album: Charity Brown. May 1975: Carl Carlton – B-side of his single "Morning, Noon and Nightime" R&B number 71 / parent album Everlasting Love. 1976: Cascade (fi) as "Korvissa Soi" on their album Cascade. 1976: Willem Breuker Kollektief on his album Live in Berlin. 1979: St. Mark Baptist Church Choir & Daryl Ellis on their Gospel Album "Our Day Will Come" Savoy Records #14497. 1979: Esther Phillips on her album Here's Esther Are You Ready. June 1982: David Frizzell and Shelly West: B-side of their single "I Just Came Here to Dance" C&W number 4/ parent album The David Frizzell & Shelly West Album. 1982: Dionne Warwick on her album Heartbreaker. 1983: Tony Joe White on his album Dangerous. 1989: k.d. lang recorded a version for the soundtrack of the 1989 film Shag. December 1994: Ronald Muldrow on his album Facing Wes. 1994: Pete Anderson on his album Working Class. April 2, 1996: The Slackers with Doreen Schaefer on the Slackers' album Better Late Than Never. 1996: Christina Aguilera recorded a version as a demo in 1996 and the track was included on the 2001 album release Just Be Free. 1998: Linda Purl on her album Alone Together. 2001: James Darren on his album Because of You. 2003: Jimmy Ponder on his album Alone. September 26, 2005: Jamie Cullum on his album Catching Tales. 2005: Bobby Caldwell on his album Perfect Island Nights. 2007: Waldeck on his album Ballroom Stories. 2009: The Heptones on their album Meet the Now Generation. 2011: Amy Winehouse on her album Lioness: Hidden Treasures. 2012: Katharine McPhee as Karen Cartwright on the NBC show Smash. 2015: Naya Rivera as Santana Lopez, Heather Morris as Brittany S. Pierce, Chris Colfer as Kurt Hummell and Darren Criss as Blaine Anderson on the Fox show Glee. ^ Warner, Jay (2006). American Singing Groups: A History from 1940 to Today. Milwaukee: Hal Leonard Corporation. p. 445. ISBN 0-634-09978-7. ^ "Ruby and the Romantics: Artist Chart History". Official Charts Company. Retrieved July 31, 2017. ^ "Ruby & the Romantics Chart History (Hot 100)". Billboard. Retrieved July 31, 2017. ^ "Hot R&B/Hip-Hop Songs: The Week of March 23, 1963". Billboard. Retrieved July 31, 2017. ^ "Item Display - RPM - Library and Archives Canada". Collectionscanada.gc.ca. 1975-12-20. Retrieved 2018-02-14. ^ "Item Display - RPM - Library and Archives Canada". Collectionscanada.gc.ca. Retrieved 2018-02-14. ^ "The Irish Charts – Search Results – Our Day Will Come". Irish Singles Chart. Retrieved February 15, 2018. ^ Whitburn, Joel (1993). Top Adult Contemporary: 1961–1993. Record Research. p. 245. ^ a b c "Lioness: Hidden Treasures Announcement". AmyWinehouse.com. Retrieved 2014-07-01. ^ "Amy Winehouse, 'Our Day Will Come' – Song Review". PopCrush. 4 November 2011. Retrieved 10 May 2016. ^ "BBC – Radio 1 – Playlist". BBC Radio 1. November 2, 2011. Archived from the original on November 2, 2011. Retrieved July 31, 2017. ^ Robert Copsey. "Amy Winehouse: 'Our Day Will Come' - Single review". Digital Spy. ^ "Ultratop.be – Amy Winehouse – Our Day Will Come" (in Dutch). Ultratop 50. ^ "Ultratop.be – Amy Winehouse – Our Day Will Come" (in French). Ultratop 50. ^ "Lescharts.com – Amy Winehouse – Our Day Will Come" (in French). Les classement single. ^ "Amy Winehouse Chart History (Japan Hot 100)". Billboard. ^ "Dutchcharts.nl – Amy Winehouse – Our Day Will Come" (in Dutch). Single Top 100. ^ "Official Scottish Singles Sales Chart Top 100". Official Charts Company. Retrieved July 31, 2017. ^ "Spanishcharts.com – Amy Winehouse – Our Day Will Come" Canciones Top 50. ^ "Swisscharts.com – Amy Winehouse – Our Day Will Come". Swiss Singles Chart. ^ "Amy Winehouse: Artist Chart History". Official Charts Company. Retrieved July 31, 2017. ^ "Official R&B Singles Chart Top 40". Official Charts Company. Retrieved July 31, 2017. This page was last edited on 16 December 2018, at 05:23 (UTC).